A man who thought he had a poltergeist was amazed to discover a mouse had been "stockpiling" items in his shed. When screws and metal objects kept reappearing in a box containing bird feed, Steve Mckears thought he "was going mad". The 72-year-old from Severn Beach, near Bristol said he found a screw in a tub of crushed peanuts in February. After the mystery continued for several weeks he set up a camera which revealed the rodent responsible. 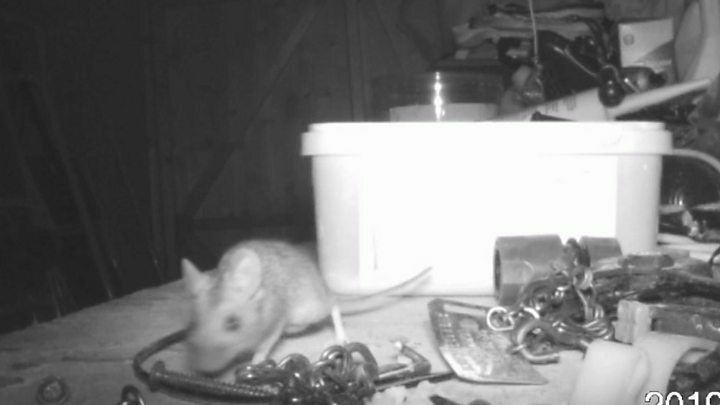 Mr Mckears said when he and a neighbour, who helped set up the night vision camera, watched footage from overnight in the locked shed, he was relieved it was a mouse "and not a poltergeist". "We were amazed at what he was doing, we just couldn't believe it," he said. Mr McKears said as the weeks went by, he found more and more objects in the container, including some heavy bits of chain. He said: "I thought 'there's something funny going on here', I'd never had a ghost in the shed before. "I was worried, I'm 72 and you hear of things going wrong with 72-year-old gentlemen in the mind. "That's why when we proved it wasn't me, I was happy. He added: "I call it Brexit mouse because he is stockpiling for Brexit, but my friend calls him Metal Mickey."